Lilacs have many uses in the kitchen and bar. It's rather common to use the tiny flowers for homemade jelly, but have you tried a lilac simple syrup? It's absolutely delicious, easy to make at home, and a fantastic way to integrate the unique taste of lilacs into drinks. The finished taste of the syrup is best described as a dark floral—almost lavender-like but distinctly lilac. It's quite lovely and wonderful to mix with, offering a fragrant taste of spring from your own backyard. Interestingly, the syrup looks almost brown in the bottle, but once mixed, it gives a soft purple hue to drinks. 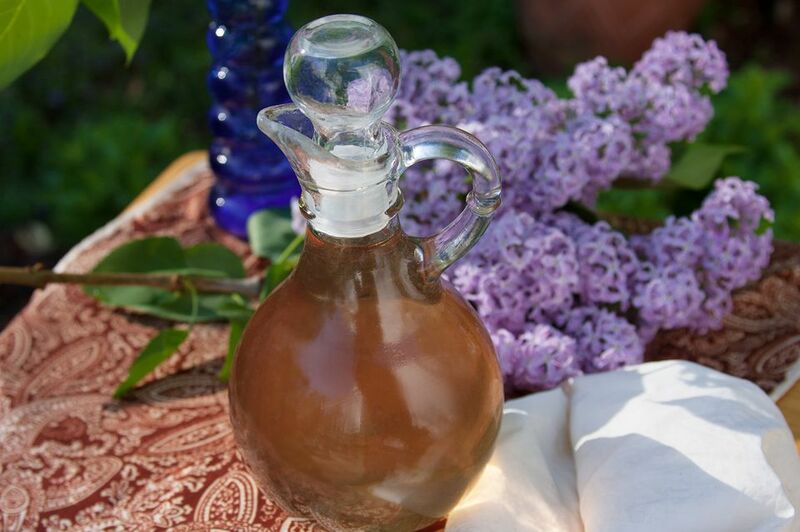 This lilac syrup is just as easy as any other simple syrup recipe. Because preparing the florets requires some extra time, this recipe is for a double batch that creates 2 cups of syrup. Lilacs are only around once a year, so take advantage of this moment! Note: while there are many steps in this recipe, this preparation is broken into workable steps to help you better plan. The first step is to gather the flower bunches and remove the florets. This is foraging at its most fragrant and it's a lovely springtime activity and removing the tiny florets is the best-smelling tedious task in the kitchen. All lilacs are not created equal and each variety of lilac will have a slightly different taste. If you have options available, give the flowers from each a quick nibble to see which taste you enjoy best. Often, you'll find the purple varieties are more flavorful than white lilacs. Once you have chosen the lilac bush, look for blooms that are nice and fresh and have flowers that are fully opened. Cut a few blooms from the bush. Move around the plant as you trim so as not to take too many flowers from one spot. Gather more blooms than you think you need. Three large branches of flowers can yield around 4 cups of florets. After gathering your lilacs, remove the tiny florets from the bunch. They come off very easily by hand: just grab the flower (or a small bunch) and pull it from the stem. Make sure that you are only getting the purple floret as the tiny green stems can make your syrup bitter. Place the florets in a fine mesh strainer and give them a good rinse under cold water to remove dust and debris. In a small saucepan, combine the sugar and water on the stove over medium heat. Stir constantly until all of the sugar is dissolved as you bring it to a slow boil. Add the lilac florets, stir gently, and cover. Reduce heat and simmer for about 5 minutes. Remove from the heat. Once you remove the pan from the stove, keep it covered and wait. As it cools and rests, the lilacs will add their sweet flavor to the syrup. The time it takes to steep will depend on the variety of lilacs used and how intense you want the flavor. Remember that this is a delicate flower and it will take 3 to 8 hours to fully infuse. When straining lilac syrup, it is best to use a fine mesh strainer and a large bowl for it to sit in. Allowing it to sit for a few minutes and giving it an occasional shake lets more of the syrup drip into the bowl as it filters through the tiny flowers. The extra quantity is small, but this is precious liquid. After straining, pour the finished lilac syrup into a glass container with a tight-sealing lid. Store it in the refrigerator, where it should keep for a week or two. Use the lilac syrup in your favorite drinks and enjoy! Taste test your syrup regularly. You might find that your syrup develops a soft flavor after three hours and it will seem like it's almost done. But, if you let it sit for eight hours, it will be perfect. The syrup should have a floral intensity that will become balanced once it's added to drinks, neither overpowering or disappearing against the other ingredients. Lilac flowers are tiny and even tinier particles will be created while making the lilac syrup. For this reason, it is essential to use a fine mesh strainer for your syrup. You may also need to strain it twice to remove every bit of lilac. While cheesecloth is often a good alternative, with syrups it will be a messy, sticky endeavor that you may regret. Lilac syrup works wonders in lightly flavored beverages and pairs particularly well with lemon and strawberry. The drinks can be as simple as adding 1 or 2 ounces to ginger ale or tonic water, or even sparkling wine. Better yet, mix it with ​Dry Sparkling's rhubarb or cucumber sodas or Q Drinks' orange or lemon sodas. A favorite recipe is a simple lilac lemonade. It's incredible and as easy as using this flavored syrup in a basic homemade lemonade recipe (1 part each syrup and lemon juice to 2 parts water). The lemonade can be used to make a lilac shandy with your favorite beer. The syrup can also be used to mix up a lilac lemon drop martini. If you want to take it a step further, use the syrup to make an amazing crème de lilac liqueur: Use vodka as the base and sweeten it with the syrup to suit your taste, similar to homemade amaretto. A lilac cordial can be made in the same manner as lime cordial, by adding citric and tartaric acids as well as a little more water to the syrup. Whatever you mix up with the lilac syrup, it's best when enjoyed while relaxing on the patio or in the garden. Be sure to share it with friends (especially if you foraged their lilacs)!